I hope you have all had a fantastic Christmas & have not suffered with these awful storms we are having in the UK!! Thankfully we have only had really bad winds & a few down pours nothing to bad. I hope Santa managed to get all your crafty stash down the chimney lol..
Jane hun can you please email me on shell-swinscoe@virginmedia.com & we will sort out your £15 voucher & get your winners badge to you. Please can you pop N&A winner in the subject bar. Huge congratulations ladies, it was a really hard choice this month! Please email me on shell-swinscoe@virginmedia.com & I will get you your Top 3 badges out to you...please pop N&A Top 3 in the subject bar. This month we have a £15 voucher up for grabs, so why not join in the fun for a chance to win!! Wow! the girls have created some amazing cards to inspire you this month! 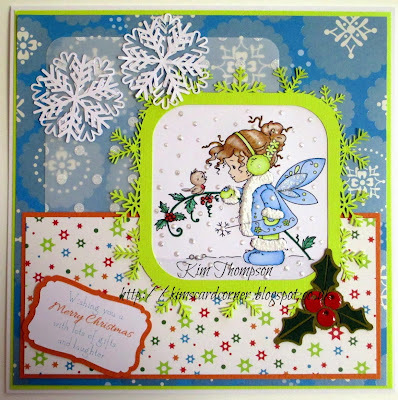 Using the beautiful Rowan Fairy stamp and the sentiment is Paula Pascaul - Big-Sentiments, Glossy Accents, Mowed lawn distress ink added using Dreamweaver brushes. Ranger Glossy Accents, Ranger Stickles 'Diamond' & Stix 2 Clear Tape. 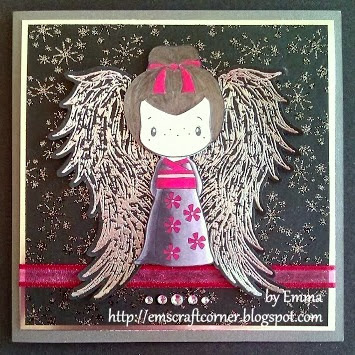 using CC Designs Geisha Emma set, Sheena Douglass Divine Inspiration, silver Wow embossing powder,black twinkle Wow embossing powder. using....'Beau & Bashful' stamp by Whimsy Stamps, clouds colour tinted using Tim Holtz broken china, 'New Bloom' design papers by First Edition, Star Dust Stickles, 'The Fun Life' tickets #2 by Whimsy, Collall all purpose glue,Collall 3D glue with tools, 6" scalloped square card blank, 'Olive Branch' die cut by C.C. Designs, 'Clouds' die cut by Joy Crafts & 'Large Ticket' die cut by Whimsy. Ok now you have until January 29th at 6pm UK time to get your girlie entries in using the blue froggie.